Get away from the four corners of your office (and still get things done). Being an entrepreneur can mean long days at the office sitting behind your desk. This can contribute to mental stress, and sitting for long periods of time just isn't good for your health. The solution? Get out of the office once in a while and ease the stress of being cooped up in the office all day. If you work from home, you will be amazed how much more productive you can be going somewhere else even if it's just for a few hours! The amount of technology that we have at our disposal as entrepreneurs makes it possible to run our businesses from remote locations, and an increasing number of companies are now allowing their employees to work remotely one day a week. Thinking about working remotely? Here are five creative locations that you can run your business from. 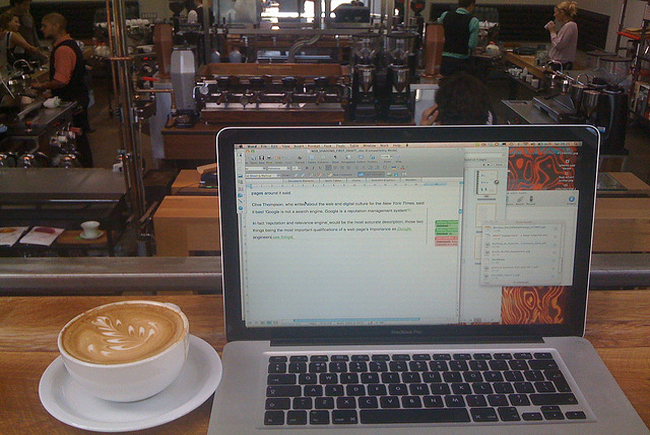 Coffee shops can be a great remote location to work from. While they can be quite noisy and full of distractions, they are a great place to head to when you need a quick break from the office and a caffeine refill, of course. If I need to get out of the office I'll head to a coffee shop and handle tasks such as answering emails and putting together to-do lists while having a cup of joe. Even if something urgent comes up while I am out of the office, I can handle it from a coffee shop if needed. Working remotely from a co-working space has two significant benefits. First, you get out of the office and surround yourself with new people, which can be a breath of fresh air at times. Second, you surround yourself with other like-minded entrepreneurs -- this can spark inspiration and even breed business connections and relationships. There are co-working spaces popping up all over, so there is a very good chance there is one very close by to your location. While many do offer private offices, I would recommend joining and getting the general membership, allowing you to work from the common areas. Take a day to go check out the local options in your area--you just might find your next go-to remote location. Sometimes the best way to recharge is to get away--and by get away I mean far away, as in a vacation. I'll often hear of entrepreneurs that say they are going to take a vacation and not check their email or take any calls. Guess what happens? They end up checking email, taking calls and working the entire time. As entrepreneurs it is hard to step away from our businesses fully, so why not go into it expecting to do a little work? That way there is no disappointment or resentment. Book a stay at a nice resort and schedule your day just like you would at the office. Check emails by the pool in the morning, head to the beach for some sun and come back to do a little more work by the pool while eating lunch. We technically work in boxes all day long, so sometimes it is nice to get outside and breathe in some fresh air. There are plenty of options--from outside restaurants that are Wi-Fi equipped to public parks. Sure, every outdoor location isn't going to have Wi-Fi, but don't let that stop you. If you really need to access the Internet for an emergency you can use your mobile device. Being outside in the fresh air away from the hustle and grind of an office environment is a great place to think clearly. Have an important decision to make regarding your business? Take a day and work outside--you will have zero distractions, allowing you to focus on nothing but that pending decision. I like to take a notepad and pen and plan new projects--especially if the weather is nice! Working from another company's office--whether you have a direct business relationship with them, a vendor relationship or you're just friends with the owner--can be a great change of scenery. While a new setting can be inspirational, you can also pick up on different office cultures and policies that could benefit your own business. This can also help to strengthen business relationships with these companies and present you with new opportunities and introductions. If you bring coffee and snacks they won't want you to leave.